New to RE:INVENTION’s blog? Our biweekly Innovation Expert Series features interviews with key executives at small to midsize companies that are notably disrupting, transforming, and innovating within their respective industries or markets. Wrapify is building a disruptive Internet of Things (IoT) crowdsourced advertising platform that connects drivers and brands to create powerful on-vehicle advertising. The San Diego based company pays drivers $400 to $600 a month to temporarily “wrap” their cars with mobile ads while providing meaningful metrics to brand advertisers via Wrapify’s proprietary app. Like Uber and Lyft, Wrapify’s business model capitalizes on the “sharing economy” (aka the “sweat your assets” economy). 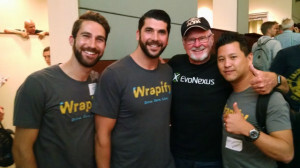 Under CEO James Heller’s leadership, Wrapify graduated early from San Diego tech startup incubator EvoNexus in June. RE: For those folks who aren’t yet aware of your startup company, can you give us a brief background about yourself and Wrapify? RE: Did you utilize any “design thinking” techniques?